WHOLE SALE TRADERS OF HIGH TENACITY POLYESTER YARN, TWISTED, 2 & 3 PLY, 210 DENIER, AVAILABLE IN RAW WHITE. 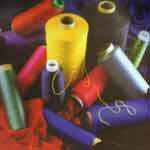 WHOLESALE TRADERS OF 2 PLY & 3 PLY, 210 DENIER POLYESTER YARN. used in garments industry for collar, raw white, high tenacity, gpd-8+,available in cheese cones & bobbin cones, for your requirements, kindly contact.